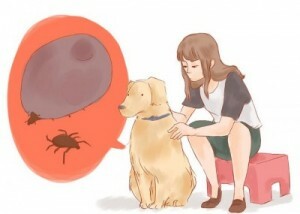 It is important to check your pets that are outside regularly for ticks. Although dogs are capable of becoming infected with the Lyme organism, ticks can also be found on cats, rabbits and other pets in your home, so it is important to check all members of your family for ticks. Ticks typically latch on around the head (ears, back of the neck, top of the head), around the base of the tail, on their underbelly, neck, as well as their feet and in between your pet’s toes. Make sure to run your hand all over your pet’s body, feeling for bumps or noticing any abnormalities in your pet’s skin or coat. Ticks are not always easy to see! The longer the tick has been attached, the larger the tick will be. Therefore, if the tick just recently attached to your pet, it may be small, so be diligent when looking. When removing the tick, it is very important to remove the entire tick. Ticks typically implant their head in the pet, making only the torso and legs visible. A tick’s head may detach if removed incorrectly, leaving the dog susceptible to infection and disease. It is best to bring your dog to a veterinarian to remove the tick. However, if that is not possible, you can remove the tick with tweezers, or better yet, a tool specifically made to remove ticks, called a tick twister (visit our clinic to purchase a tick twister!). If removing the tick yourself, be very careful not to squeeze the tick’s body (can squeeze Lyme organism into the dog), and do not burst the tick’s body (you can get the Lyme organism on your clothing and could absorb it through a cuts or scratches on your skin). Gently push the twister against your dog’s skin, near the tick. Slide the notch of the twister under the tick. Rotate the twister slowly and continuously. Then it is safe to gently pull up on the tick. If you do not have a tick twister, and are unable to bring your pet to a veterinarian, you can use tweezers to remove the tick. Pinch the tick with tweezers as close to the pets skin as possible. Apply gentle, steady pressure with the tweezers to remove the tick. You will feel the tick “let go” as you are gently pulling it. 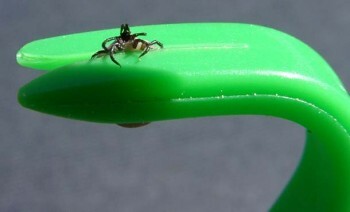 After removal, inspect the area thoroughly, as well as the removed tick. Make sure the head, mouth parts, and all the legs have been removed. Save the tick, and book an appointment with your veterinarian as soon as you can so they can determine if the tick was removed completely, and to discuss follow-up care and disease testing.